Shapeways on a tear! Gets $6.2 million funding and millionth sale. Congratulations are in order for 3D printing service Shapeways. They have two big events to celebrate this week. The company announced this week that it has printed and sold one million objects. And people say 3D printing is just a tinkerer’s hobby. I don’t think so. There are over 6,000 independent designers who sell their products — unique products they’ve personally designed — through the Shapeways marketplace. They can choose from over 30 materials to offer these products to customers. If you are new to the Shapeways marketplace, just think of Cafepress or Zazzle, where people upload art designs to the marketplace and customers can purchase those designs printed on shirts, mugs and other products. Shapeways allows a 3D designer to set up his own online store, and customers can order the product in any number of available materials. Between this marketplace and people just wanting to order their own physical model of one of their 3D designs, Shapeways is on firing on all cylinders. Apparently venture capitalists are noticing the Shapeway’s momentum. The company announced that it had completed a $6.2 million series B round of financing from Lux Capital, a New York venture capital firm. Lux joins existing investors Union Square Ventures and Index Ventures. Shapeways plans to use the money to expand its service and hire new employees. This company is heading for an IPO someday. I’ve put my money where my mouth is, investing in 3D printer stocks over the last year; the rising stock prices reflect the investor interest out there, and of course the growth the public companies like 3D Systems and Stratasys (includes Objet now) are experiencing. I, for one, cannot wait to get my hands on some Shapeways stock someday. 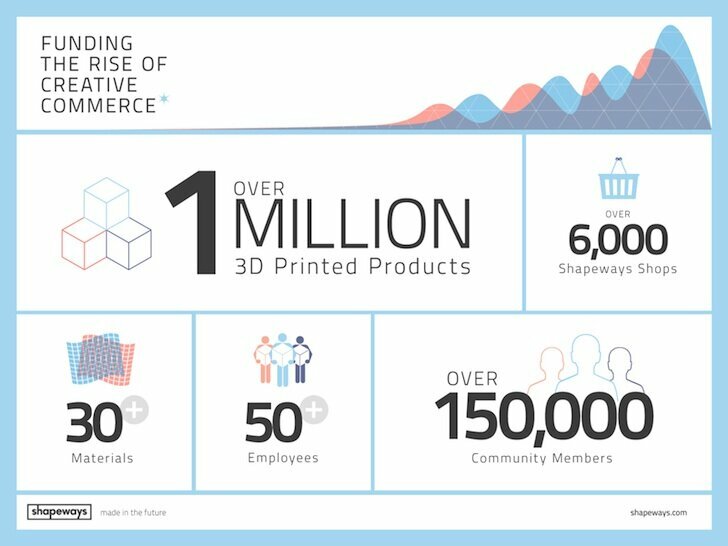 Congratulations Shapeways. I look forward to the day that you announce your first billion sales.